On 31 July 1865, Queensland's first railway line (the first narrow gauge main line in the world) was completed with the opening of this little station at Grandchester, west of Ipswich. 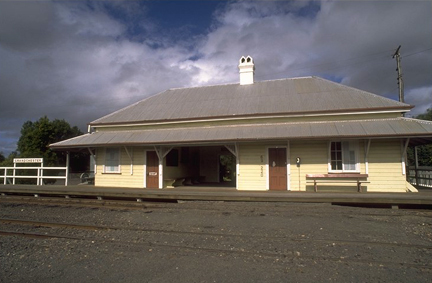 The building was also the residence of the station master. This was the initial stage of the rail line between Ipswich and the Darling Downs that was constructed to allow livestock and produce from the rich Downs region to get to a port for export to other parts of Australia and overseas. The ceremony of turning the first sod for the construction of the railway had been performed by Lady Bowen, the wife of the governor, on 25 February 1864. That means that the construction of the 35 km of rail took just under 18 months. 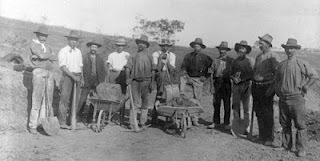 Teams of men such as those pictured below did this back-breaking work without the assistance of today's heavy earth-moving machinery. 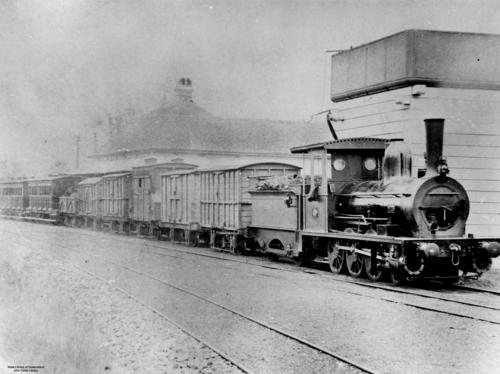 The photograph below, from around 1879, shows a steam locomotive at the Grandchester station. The station house is just visible at the rear of the picture, and the square structure behind the engine is the water tank - a single tier tank made from cast iron. 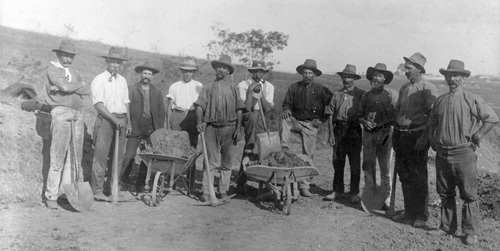 The site of the railway station was originally known as Bigge's Camp, so named after pioneer pastoralist Frederick Bigge (the older brother of Francis "Little" Bigge, a Cleveland pioneer) who had camped in the area on his way to his land holdings at Brisbane Station some years earlier. The local story that explains the name change says that Governor Bowen thought that "Bigge's Camp" sounded too much like "Big Scamp", and therefore suggested that the Latin equivalents grandis for "big" and chester for "camp" be combined to form Grandchester. Is it true? I'll let you decide for yourself. a current QR National loco pulling about a kilometre of coal wagons, presumably on its way to Ipswich. Did you know that the National Trust of Queensland has recently been given management rights to this treasure and it will be opening to the public regularly? No I didn't know that, bit it's great news! The coal trains that pass through Grandchester now are 665 metres long, and their destination is the Port of Brisbane (but they do roll through Ipswich when en route). Thanks for the up-to-date stats!